Apple wants you to use your iPad or your iPad Pro like a proper computer: But how do you go about doing that? And does it actually work? Here are the apps, software tweaks, and accessories you need to turn your Apple tablet into a makeshift laptop—and some of the annoyances you’re still going to come across. 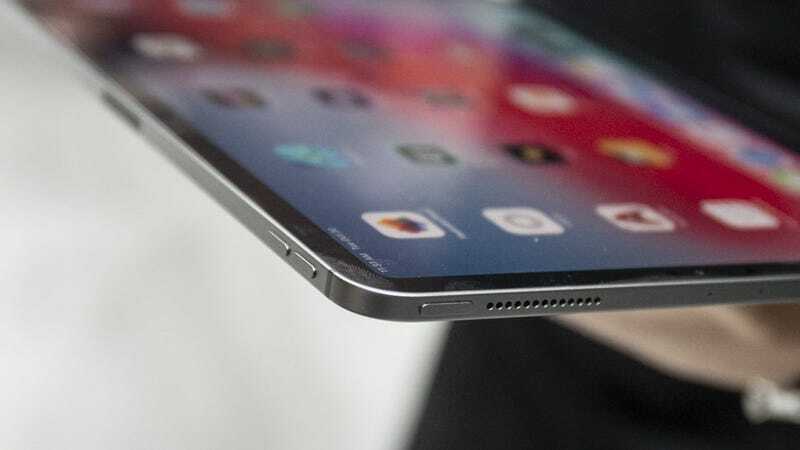 If you’ve not used an iPad lately, then there are a few iOS features made exclusively for Apple’s tablet that you should know about. In terms of using your iPad like a laptop, the most important ones are Slide Over and Split View. 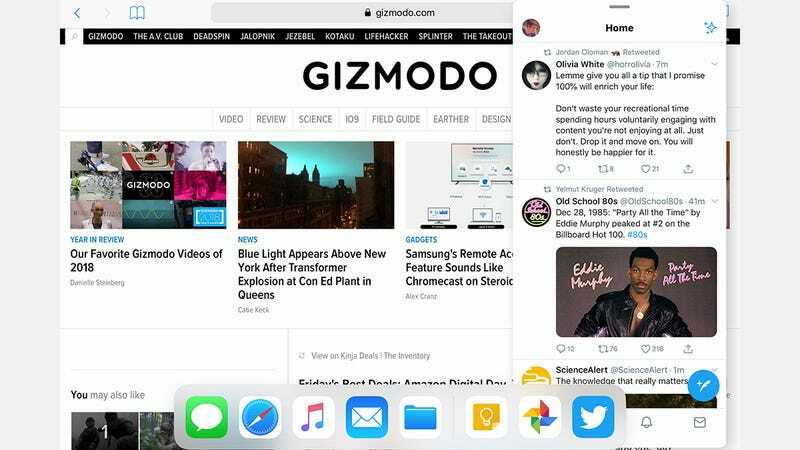 They’re both ways of getting more than one app up on screen at once, either via a hovering window (Slide Over) or a docked window (Split View). With one app open, just drag another into play from the dock (a quick slide up from the bottom), then fix the app to the side of the display or leave it floating, by dragging the grey bar at the top. With Slide Over, you can dismiss a floating app by quickly swiping the grey bar at the top to the right or left, and bring it back by swiping in from the edge of the screen. With Split View, drag the divider bar in the centre to the left or right to change how much screen space each app is given. When you’ve got apps in Slide Over or Split View mode, you can drag text, pictures, and files between them: Touch and hold an item on one side, then drag it across into the other app. Quite how well this works varies between apps—Twitter will copy the tweet URL rather than its text, for instance—but it often comes in handy. There’s the dock at the bottom, which we’ve already mentioned, and which makes flicking between different apps just that little bit easier. The iPad has now adopted the gesture controls ushered in with the iPhone X too—this was a necessary move with the removal of Touch ID from the iPad Pros, but the gestures also work with older iPads too. 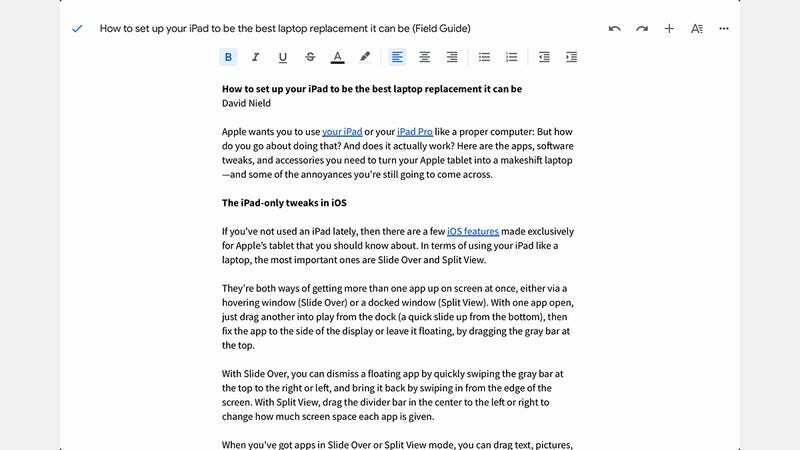 Starting with word processing, the likes of Apple’s Pages (which comes built into iOS), Docs from Google, and Word from Microsoft are seriously helpful in getting through a substantial amount of text (note that to edit as well as view files in Word, Excel, and PowerPoint for iOS on an iPad, you’ll need an Office 365 subscription). For spreadsheets and presentations, it’s the same suspects from Apple, Google, and Microsoft, which have all matured impressively well on iOS (and mobile platforms in general). Image editing is well covered: From Snapseed to VSCO to Adobe Lightroom CC to Pixelmator, there’s plenty of choice, and add in the default Photos app from Apple and Google Photos and you should be able to replicate a lot of what you do on a laptop, especially if you’ve got an Apple Pencil. 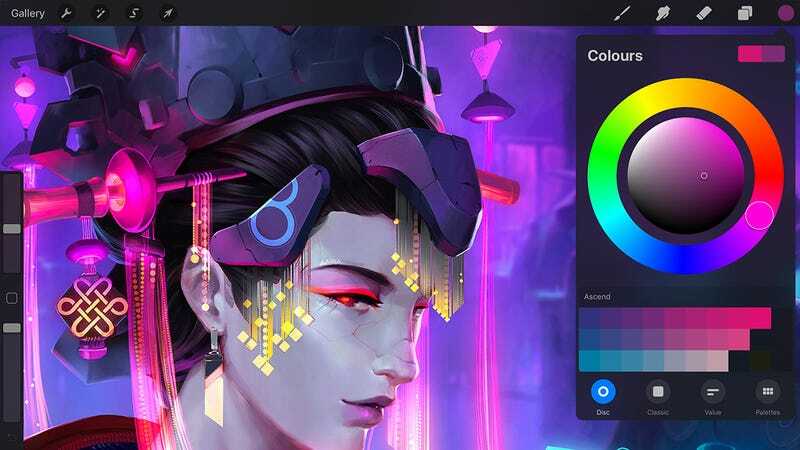 Though the most exciting new image editor, a full version of Adobe Photoshop, won’t be available until later in 2019. Speaking of the Apple Pencil, the iPad is great for digital artwork and sketching: The likes of Procreate and Autodesk SketchBook make this a much better device than a laptop in many ways. What it still lacks is a way to do those kind of detailed, pixel-by-pixel edits that are often needed at the professional level—it’ll be interesting to see how the “full” version of Photoshop tackles this. As for other serious work apps you might want to install to use an iPad as a laptop, we can recommend Slack, video editing powerhouse LumaFusion, Evernote, TeamViewer, Ulysses (for a more minimal, intuitive word processor), and Notability for converting handwritten notes into files and text you can actually use. Bundled Apple apps like iMovie and GarageBand are no slouches either. An impressive roster of apps then, but they’re not quite up to desktop level yet. With Word, for example, you can’t change paragraph settings, or modify and apply stylesheets, or edit any imported charts. You can drop in pictures and shapes, but you can’t do quite as much with them, or modify them quite as easily. Almost all these apps still feel exactly like what they are: Cut-down versions of the full apps. The iPad is closer than ever to a laptop’s functionality, but its definitely not there yet. To help turn your iPad tablet into a laptop you need some accessories. Primarily, that means a clip-on keyboard that gives you a proper typing experience and saves you having to jab at the touchscreen with your fingers. 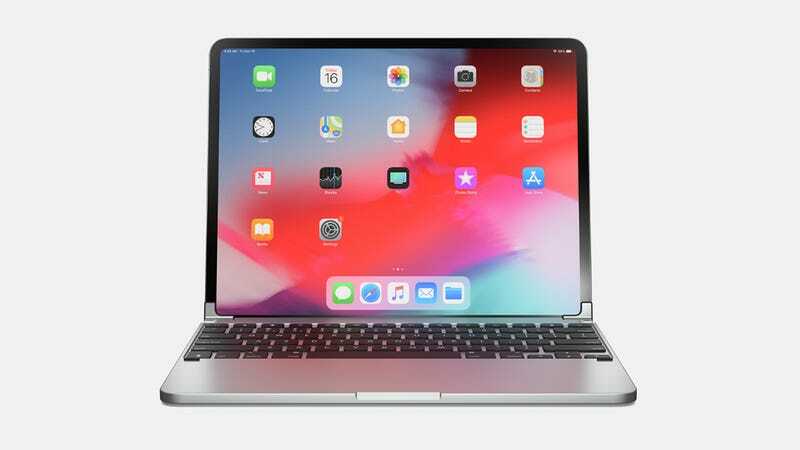 The obvious place to start is with the Smart Keyboard Folio that Apple itself sells, yours from £160 and up depending on the size and age of your iPad Pro. It attaches with a snap, requires no pairing or charging, and is actually reasonably comfortable to type on too. Alternatives are available, like the Brydge Pro models due to launch at the start of 2019 from $150 (about £117, UK price TBA). 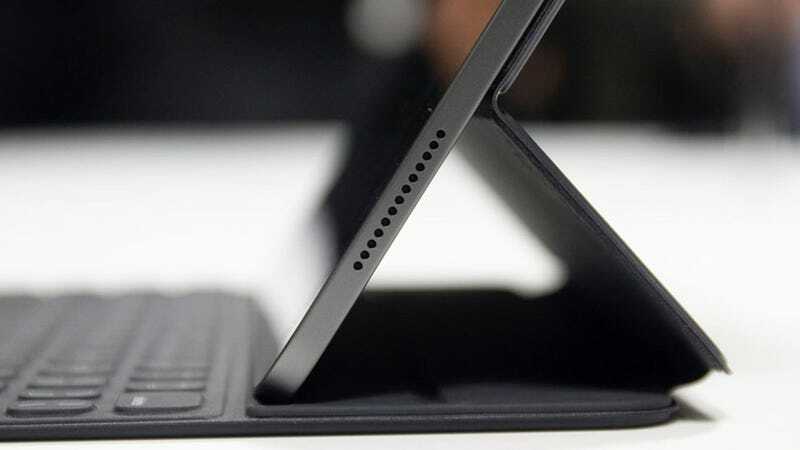 They give a more solid, more laptop-like feel to your typing, or so they promise, and unlike the Smart Keyboard Folios that Apple produces itself, you can have the tablet set at any angle you like for easier viewing. Apple doesn’t make its own keyboards for the standard iPad, but again you’ve got several options from third-party manufacturers: There’s the Logitech Slim Combo (£99) for example, with backlit keys, a choice of viewing angles, and durable protection for when it’s doubling up as a case for your Apple tablet. Away from keyboards, the first or second-generation Apple Pencil (£90 and up) is ideal for digital artists and dedicated note-takers. Most standard USB-C adaptors will work with your iPad Pro—including docks and video cords. If you want to go with more expensive officially licensed products the USB-C Digital AV Multiport Adaptor (£75) and USB-C to SD Card Reader (£40) are both worth a look, though they’re both rather limited compared with the laptop equivalents: You can only mirror the iPad Pro screen rather than extend it, and images can only be imported via Apple’s own Photos app in iOS. Now RAW images quite yet. Is an iPad a laptop replacement? So get everything set up as we’ve described above, and does an iPad actually work as a laptop? 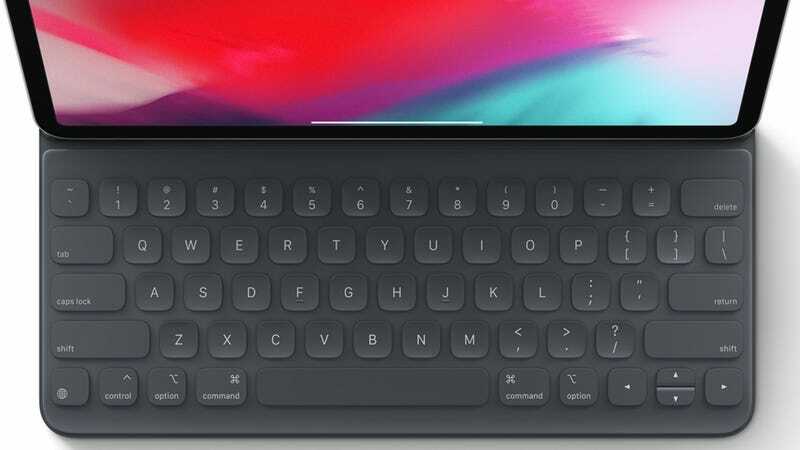 Stick a keyboard on an iPad or iPad Pro and it certainly looks a lot like a laptop replacement—you can actually type properly on it, albeit with a more cramped and less comfortable keyboard than your laptop has (probably—we haven’t seen your laptop). Putting some notes into Google Docs or firing off an email in Mail works perfectly fine, though you will feel the omission of a trackpad (your fingers might naturally start to drift down below the keyboard to find one). When it comes to selecting items from menus, or scrolling through a document, you need to go back to using the touchscreen. We often feel the absence of all those keyboard+trackpad (or mouse) combinations that come in so useful when editing text, or working on images, or getting around the web (Cmd+click to open a link in a new tab, for example). There’s just not the granular control without a proper pointing device, and it’s going to be interesting to see how Photoshop tackles this when it arrives on the iPad next year. For text editing alone, the keyboard makes a big difference, from being able to accurately select text with shortcuts, to hitting Enter to submit searches and so on without having to reach for a button on screen. It works so much better than a touchscreen keyboard, and apps like Word and Google Docs are now mature enough on iOS to let you do most of what you would do on a laptop. But for presentations, or spreadsheets, or image editing, the bottom line is that a finger and a clip-on keyboard isn’t as intuitive as a mouse (or trackpad) and keyboard. 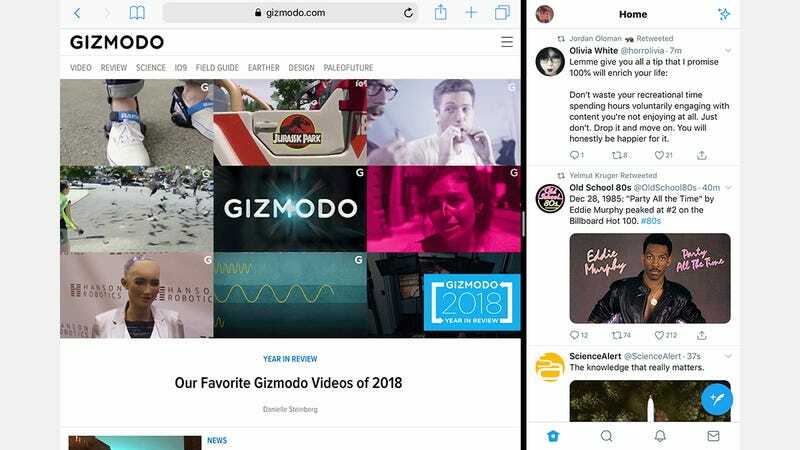 Added to that, the majority of apps—from Word to Chrome—are cut-down, mobile-optimised versions of their desktop/web equivalents: For getting complicated work done, an iPad can’t replace your laptop yet, even if the gap is closing.